Angie is a Master Hair Stylist and Image Consultant in the industry since 1996. She is a graduate of The Academy of Cosmetology with advanced training in Redken, Kerastase and Great Lengths and has Certified Oncology Hairdressing foundation training. Angie has a passion for doing Great Lengths hair extensions certified and trained in Toronto,Ontario, Angie is also sought after for her cutting edge techniques and her attention to detail. She has a profound dedication to her craft and client relations and loves the challenge of running her own salon surrounded by her friends. Melissa is a Master Hair Stylist, Make up Artist & Educator in the industry since 2003 specializing in make up application & lessons, special occasion up-dos and color. She is educated in Redken, certified in Inverness piercing, Mac makeup, Makeup forever and youngblood mineral makeup. Education is and will continue to be a main focus. Melissa has had the great opportunity to create multiple programs concentrating on updos, styling and new stylist mentoring. Melissa is a 2 time 1st place winner in the mens cutting, 2 time 3rd place winner in men’s & ladies trend cutting. Sara Jones is a Master Hair Stylist and Image Consultant in the industry since 2004; specializing in men's and ladies cut and styling.  She is a graduate of the Hair Design Centre with advanced education in Redken and Kerastase. Sara is a fiery, outgoing hairstylist, focusing her attention on each individual clients needs, while offering exceptional customer service. "I love a fantastic blowout! If anyone tells you your hair is too big get rid of them! You don't need that kind of negativity in your life!" Sara Speck joined our team in October 2015, from Maritime Beauty Supply in downtown Halifax. 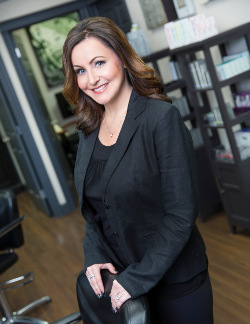 With her extensive knowledge in all things beauty, she is the perfect addition to our family! Sara has a love for fashion, animals, make-up and loves dressing her little girl "P" in the latest trends. "On a bad day, there is always lipstick!" Melodie Zanet graduated from the highly reputable Medes college of Esthetics in New Bruinswick in 2003. Meoldie's post graduate courses include International Dermal Institute, Dermalogica skin care, LCN gel nail technician, Jane Iredale minerals & Youngblood mineral Make up. Reflexology, electrolysis hair removal and, most recently, lash extension. 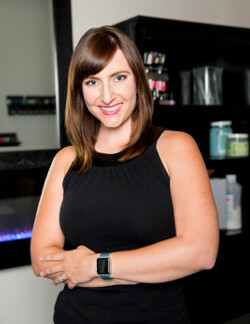 With an eye for detail, precise hands, a desire for knowledge and a love for improving, Melodie finds much enjoyment helping her clients feel and look great. Arielle Flemming is a Stylist in the industry since 2011 specializing in color and special occasion upstyles. 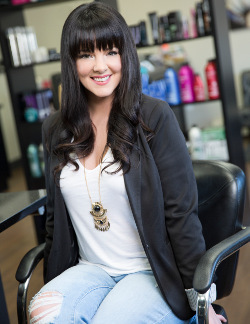 She is a graduate of the Hair Design Centre with advance education in Redken and Dermalogica product knowledge. Arielle is friendly with an upbeat personality who approaches every client as if they are family with the customer service being her number one passion. She continues to put her focus on education in new products, technology, hair trends and skin care. 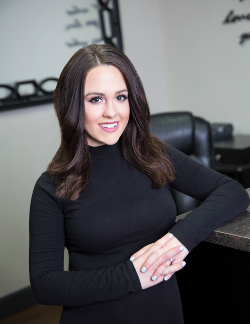 Jessica Brazil is a Master Esthetician in the industry since 2007, specializing in Foot Care and Skin Care. 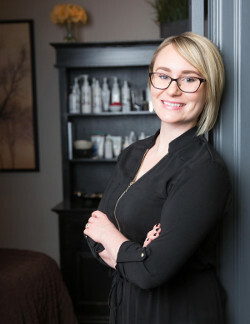 She comes to us from Bell Island, NL as a graduate from Le Moine's School of Esthetics & Hair Design with advanced education in Yonka, GM Collins and Dermalogica products. Jessica is known for her bright smile, caring nature, postive attitude and Newfoundland whit. Having a certificate in Continuing Care says a lot about her bedside manner, softhearted nature and her want to help others. Chelsea comes to us from HS Studio SalonSpa as a Master Stylist in the industry since 2011, specializing in Color, Mens Cutting and Babe Fusion Extensions. After graduating from the Hair Design Centre, she moved right into a six month apprenticeship with our very own Melissa- taking the time to hone her skills, further her education and find her confidence! Since then she has spread her wings- perfecting the art of balayage, gorgeous blondes, and clean men’s cuts. You will love Chelsea’s zest for life, motivation to grow, commitment to fitness and her love of animals- especially her babies Zara & Nugget .